Running out of tasty dinner ideas for the family? Pick up some ground beef and get cookin'! These 25 Ground Beef Recipes are sure to become instant classics. With recipes ranging from ground beef casserole recipes to healthy ground beef recipes and so much more, we're certain you'll return to this free cookbook again and again. Take a peek inside to see all of the ground beef dinners and dishes we have to offer. You'll see why these are our best ground beef recipes that are full of that “OOH IT'S SO GOOD! 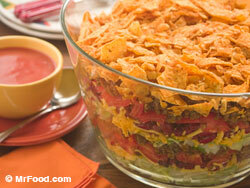 !®" And with this many unique ideas, you'll never be left wondering what to make with ground beef again! Download your free copy of Ground Beef Recipes: 25 Quick & Easy Recipes for Ground Beef today! Ground beef is a staple base ingredient that's guaranteed to be a crowd-pleaser for any entree. If you decide to try one of our easy recipes with ground beef, we know you won't be disappointed! These quick ground beef dishes are great for any lifestyle, from our guilt-free, healthy ground beef recipes to our out-the-door, quick ground beef recipes. 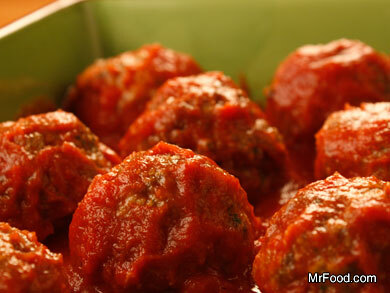 Our free eCookbook has over two dozen easy ground beef recipes made to please the entire family. Learn how to cook ground beef like a pro with these simple recipes! Looking for some easy recipes with ground beef that you won't have to feel guilty about? With these healthy ground beef dishes, you won't have to! 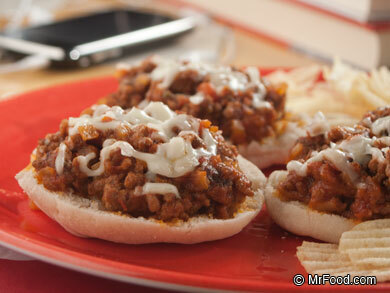 Our Chunky Sloppy Joes (page 2) are actually good for you, and hearty and flavorful too! We're sure Mom would approve if she saw you making our Homestyle Meatloaf (page 4) because we've mixed in a few veggies. Perhaps best of all, we've included some great tips on How to Reduce Fat in Ground Beef (page 6) for your ground beef meals! If it's not macaroni and cheese or pizza, then your kids won't even touch it, right? We're here to make things a little easier with some fun recipes for ground beef. Let your kids help you in the kitchen with our snack-sized Beefy Pizza Muffins (page 7). Or turn dinnertime into a treat they won't be able to refuse with our Spaghetti Sundae (page 8)! Or serve up a side of our Cheesy Burger Fries (page 9), and your kids will be begging for you to make a ground beef recipe every night of the week! While these ground beef recipes for dinner are certainly crowd-pleasers, they're also friendly on your wallet because they use ingredients you probably already have in your cupboard! Plus, they show you that you don't need to be a professional chef to make meals that everyone will love. So save your money, and make one of our best ground beef recieps for dinner tonight! From dinner entrees to side dishes, we know you'll agree that these easy ground beef recipes are full of that “OOH IT'S SO GOOD! 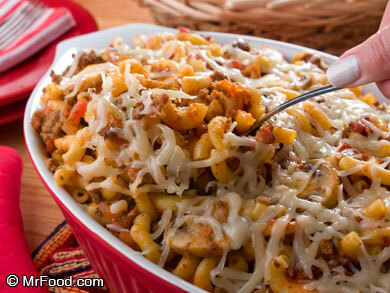 !®"
Nothing says "home cooking" like an easy ground beef casserole recipe! Casseroles are a great meal idea for any night of the week, like our Baked Goulash (page 12), filled with meat, cheese, and pasta. If you're worried that dinner has gotten a little bland, try our Enchilada Casserole (page 14). Rich and hearty, this is one dish you aren't going to let out of your sight! For something a little more fun, we recommend our Pizza Casserole (page 15). Using only five ingredients, you'll have dinner on the table in no time at all! Who has time to slave over the stove for hours? No one. That's why we've crafted these easy ground beef recipes! Try our Fifteen Minute Meatballs (page 17) and you'll be amazed at how you can start these at the same time as your spaghetti and still finish right on time. Or give our Shortcut Bacon Cheeseburgers (page 18) a try, which take only 10 minutes from top to bottom. Our Easy Cottage Pie (page 21) is an English classic that your family can enjoy in under 30 minutes. Don't you love quick ground beef recipes? Nothing's going to warm up your insides like a hearty, delicious bowl of chili. We recommend our Cincinnati Chili (page 22). Filled with cocoa, chili powder, ground beef, and a secret ingredient, it has the authentic Midwestern flavor you crave. For an all-in-one chili recipe, try our Chunky Vegetable and Beef Chili (page 25), filled with tomatoes, zucchini, and bell peppers. And who doesn't love a fresh bread bowl? Our Bread Bowl Chili (page 26) will fill you up! As a fan of Mr. Food's Quick & Easy cooking philosophy, we know you can see the value in this free ebook. Try out these easy gound beef recipes with the free Ground Beef Recipes: 25 Quick & Easy Recipes for Ground Beef. And if you subscribe to receive our newsletter, you'll see how much fun it is to be a part of the Mr. Food community! If you've ever searched for quick and easy recipes, fast dinner ideas, slow cooker recipes, or anything in-between, let MrFood.com deliver triple-tested recipes straight from our Mr. Food Test Kitchen that are both easy to make and delicious to eat. down loaded to my desktop. always there when i need it. I love to do this in the future.... great recipe! Why print it? I downloaded the entire set on my iPad. They are just a touch away. You can download it any computer. Save it to your desktop and they are available at any time. the ground beef recipe books looks and sounds wonderful. i would love to have one but i am pressed for time, ink and paper to print the book. sounded great and helpful but my time is spent taking care of my parents. (94years old and 88 years old). thank you anyway. Install an ADOBE PDF PRINTER on your computer. It will print everything to a PDF file to be saved on your computer. Sweet sounds great and easy love it. I'll print you a copy lol, or go to the library or kinkos. Perfect for office potlucks! Thanks Mr. Food! I REALLY love your website, news letters and enjoy the ecookbooks. I get some of the best recipes from you and in my book you're better than Taste of Home!!!!! Thanks. I appreciate the newsletters and look forward to trying lots of new recipes. THE 2 Minute Hawaiian Pie was a hit. This looks like it is going to be a very helpful to find new recipe to cook for my family and friends. All you need to do is click on the red circle that says "GET MY FREE EBOOK" anywhere on this page and it will download to your computer. Enjoy! do I get my free ground beef book? Recipes sound easy and delish!! Can't wait to try one. Yes, it is safe to download our eCookbooks. Thank you for asking! I'm trying to find a recipe shared on Mr Food. Seemed easy but it's NOT... Slow cooker Lagasna Looked wonderful. Been on this site for hours and still can't find it... what's my problem???? Here is the link to that recipe...http://www.mrfood.com/Slow-Cooker-Recipes/Slow-Cooker-Lasagna-4276. Enjoy! I have enjpyed Mr. Food for years. He will be missed by many! Hi, I am typing up a recipe "Down Home Meat Loaf" and I didn't get down how much onion to use. Can you tell me? I don't even know which e-mail I got it from and I'd like to make the meatloaf next week sometime. thanks. The joy of watching Mr. Food on television, he will be well miss. His famous line, "Ooh It's So Good" will be past on in or to my generation. To let them know what Mr. Food helpful tips meant to me. You will be truely miss with love. You are in my heart forever and ever. I enjoyed Mr. Food each day and was impressed with his receipts. He will surely be missed. I am sorry for the loss of such am icon. I watch Mr. Food everyday. I want to start eating healthy, so I would like this cook book. Cooking is one of my pet peas. I wanted to download the Ground Beef Recipes: 25 Quick & Easy Recipes for Ground Beef, but I was given an alert that this type of download would be harmful to my computer. Your comments please. It's just a .pdf file that you download with Adobe reader. I'm sure it said it "could" be harmful not necessarily "would" be and that's probably because it's an unlicensed file which most free downloads are not usually licensed. I have opted to download it and it's fine. just bought 1/2 of a beef. with lots of hamburger in my freezer, this will be a great help. thanks!